FESPA Brasil Forum 2018 was held in October and November 2018 via a partnership between FESPA and APS Eventos Corporativos. It proved that sharing information with industry professionals is critical for the industry growth. Alexandre Keese, Managing Director at APS Marketing de Eventos, led the lectures in the three locations. According to the executive, the results of the initiative is the best possible: "The 3rd edition of the FESPA Brasil Forum was a great success. The meeting, whose main objective was to add value to the digital printing market, presented the findings of the most recent Print Census, a worldwide research conducted by FESPA in partnership with InfoTrends. These are 6 key points that will help professionals to better understand our market from data that portray where we are and what the trends for the next few years will be. Speaking of the FESPA Print Census − a unique research project that collects and shares market intelligence, developed in a partnership between FESPA and the renowned research institution InfoTrends − Alexandre Keese recalled the main points of the latest research promoted around the world and released in 2015. In this way, it was possible to have a quick glance into the sector in that period, and what changed from the last Census to the current one. In 2018, Brazil was once again relevant for being among the top ten countries in number of interviewees. The reasearch comes to help the entrepreneur understand the importance of creating new products and opportunities using digital printing as a technological pillar since it comes to add value and meet customers’ demands especially through diversification. The first point to be assessed by the FESPA Print Census is the market optimism. Entrepreneurs are confident about their business prospects, so that 83% can see a bright future ahead for their companies. The second point focuses on the customers’ demands, ranging from just-in-time deliveries, through short run orders to customized products. This reinforces the strengths of digital printing, i.e, the fast production and job changes. These changes also stimulate other needs such as investment in the team’s technical training and mastery of color management. The third point highlights the product mix. Although the most popular applications keep on the rise, such as banners and billboards, other options come out, such as backlits and decorating materials. Alexandre explains that digital printing allows the creation of these new products, thus giving new insights to entrepreneurs. The development of print products that can be used in POS, for example, stands out in this regard. The textile growth is the fourth point. To get an idea, 56% of the textile printing companies have invested in digital, and another 19% plan to do the same for the next two years. Areas such as sportswear, fast fashion and soft signage are the segments most prone to consume digital printing. The digital printing growth is due to several factors, such as its quick-to-market dynamics, allowing a unique and much needed agility these days. The investment in technology within the digital printing chain is FESPA Print Census' fifth discovery, presenting how the area's entrepreneurs are managing the demand for orders more efficiently. An example is the prepress role in this new workflow. There is now a need for more process control and new tools focusing on the final product finishing. Web-to-print stands out as a compelling opportunity to reach new customers more efficiently, having the Internet as an ally. Finally, the last point assessed by the FESPA Print Census 2018 is printing sustainability. New demands from society have made the industry change its mind and look for a more sustainable production along the whole chain. What FESPA did realize was that a large part of the entrepreneurs − especially due to the digital printing − managed to transform their production, by turning it into a more eco-friendly without additional costs. Out of these conclusions, Alexander Keese considered that the industry undergoes a great transformation and keeps reinventing itself, and the digital printing plays a huge role in this process. For this reason, it is important for the entrepreneur to focus on efficiency. And an exhibition like FESPA Brasil showcases all innovations the market has to offer. 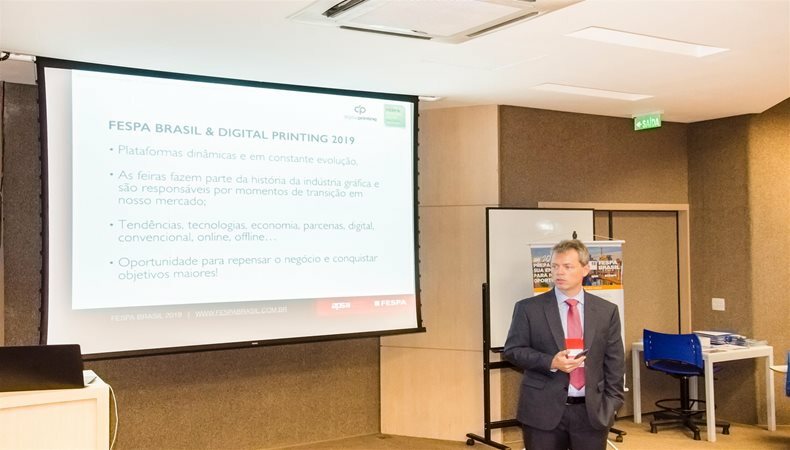 At every single event, Alexandre Keese presented the solutions that will be showcased to the Brazilian market and the innovations and initiatives that will be brought to FESPA Brasil 2019, which is further strengthened by the concurring Digital Printing Expo, an exhibition focused on digital printing for short runs and high relevance prints. These exhibitions take place from March 20 to 23 at the Expo Center Norte in São Paulo. The FESPA Brasil Forum was sponsored by large players in digital printing, which presented their technologies and transmitted concepts about how it is possible to transform the production process with digital technologies. In the São Paulo leg, the Forum had Konica Minolta's Platinum Sponsorship. Luciano Cazemiro, a specialist in industrial printing at Konica, spoke about the company's structure in Brazil and worldwide, as well as the portfolio and the characteristics of the solutions for important markets, such as digital label printing and the commercial segment. As a Gold Sponsor of the São Paulo leg, Roland’s product coordinator Tiago Barbosa lectured on the company's product line in the country, especially the printing-related ones. He gave useful pieces of advice, such as the special attention towards short runs and customized products, such as cell phone cases, and the strength of sublimation in Brazil. Tiago also spoke about Roland’s product line for packaging testing on the final substrate. In Rio de Janeiro, the Gold Sponsor Alltak highlighted, through its Managing Director Marcelo Souss, how vinyl has become an option to transform objects and environments. From furniture to fridges, wrappings have been used a lot to create unique and creative objects. The Interior Decoration segment has also realized how vinyl is a practical and lucrative alternative to completely change the ambiance, whether residential or commercial. The textured media simulating bricks, wood or whatever else the imagination can devise were also approached. This evolution of media technology has increased innovation, by allowing printing effects and shapes on different color media in addition to white ones, thus increasing the degree of customization. The topic was also dealt with in the city of Curitiba by Lael Nazario, Commercial Manager at Alltak. Ampla was also Gold Sponsor in Curitiba and gave two lectures. Sidnei Marques, partner COO, spoke on the lecture topic "Understanding the Total Cost of Ownership (TCO) of a Digital Printer" on the variables that should be taken into account by the digital printing entrepreneur when evaluating the purchasing cost of a new equipment. The presentation provided information based on data and concrete facts, objectively supporting the planning and decision making of new business investments. In the lecture "Industry 4.0 − How to Prepare your Company for this Revolution" Ampla's New Business Managing Partner, Ricardo Lie, addressed topics such as the meaning of the Industry 4.0, industry evolution from 1.0 to 4.0, consumer and environment trends and their impact on the industry, in addition to technologies and strategies for the Industry 4.0. The FESPA Brasil Forum in São Paulo had the Platinum Sponsorship of Konica Minolta, the Gold Sponsorship of Roland and the Silver Sponsorship of Ampla, Aplike, Fremplast, Global Química & Moda, SAi, SPGPrints and Zênite. Rio de Janeiro had Mimaky as the Platinum Sponsor, Alltak as the Gold Sponsor and Ampla and Convertech as Silver Sponsors. In Curitiba, Mecolour was the Platinum Sponsor, Alltak, Ampla and Epson were Gold Sponsors and MCF was the Silver Sponsor. After an in-depth analysis into the market landscape with the FESPA Print Census, it was time to see how this data can go into an intelligent Marketing and Sales strategy. Alexandre Keese started off by questioning: why do you gain customers? That is, what makes the customer choose you over others? This question should be asked not only by the company itself but also by its customers, in order to get an idea of ​​how their services are evaluated. It is important to always be in touch with the customers in order to understand what their needs are. The specialist explained the importance of making a full diagnosis of the company to verify what can be improved. That starts with the analysis of the planning stage, going through the customer prospection approach, up to the negotiation and closing processes. And, of course, boasting an after-sales service that can guarantee the customer’s loyalty is a plus at all times. Therefore, providing training to the team is critical. Besides the understanding of your own company and the market in which you are operating, you must be familiar with the customer profile, what are their habits and behaviors in order to always offer the best option. This involves a reflection on costs and opportunities as well. An example is to add value to what is offered, so that the customer feels the need for it. A good research will make the company anticipate the client’s needs, thus offering exactly what they need − a unique differential nowadays. The 3rd FESPA Brazil Forum took place honoring the FESPA’s slogan "Profit for Purpose", which is a commitment to reinvest in the digital printing industry, sharing quality knowledge with professionals. Another objective is to promote the characteristics of each region, by bringing a focused content to the industry’s entrepreneur. All attention now goes to FESPA Brasil 2019, which will take place from March 20 to 23 at the Blue Pavilion at the Expo Center Norte, in São Paulo. It will be the moment to catch a glimpse of the trends and applications of digital printing for visual communication, large formats, communication and digital signage, soft signage, textile, wrapping, sublimation, interior decoration and much more. You can register to visit the exhibition at: www.fespabrasil.com.br/en/visitar/cadastro.